We have been having the most gorgeous weather here over the last few days and it has been wonderful to enjoy a bit of sunshine and see the blue skies! In fact, the whole of this week is forecast to be bright and sunny which is fantastic, especially since it is Max’s school sports day on Wednesday. (Last year was freezing!). Today was a particularly beautiful day and as a bonus it was also a bank holiday, so we were all off work and school. 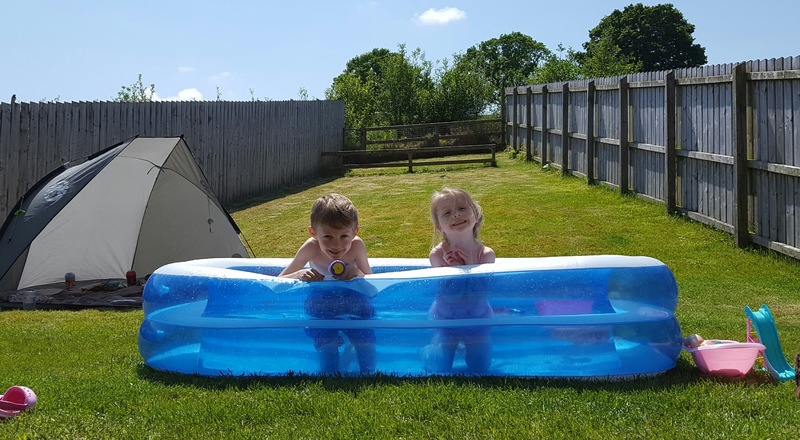 We had thought about going away for the day but instead decided to get the paddling pool out, the sun tent up and just spend it at home in the garden playing games, having water fights, picnicking, soaking the dog and chilling out. 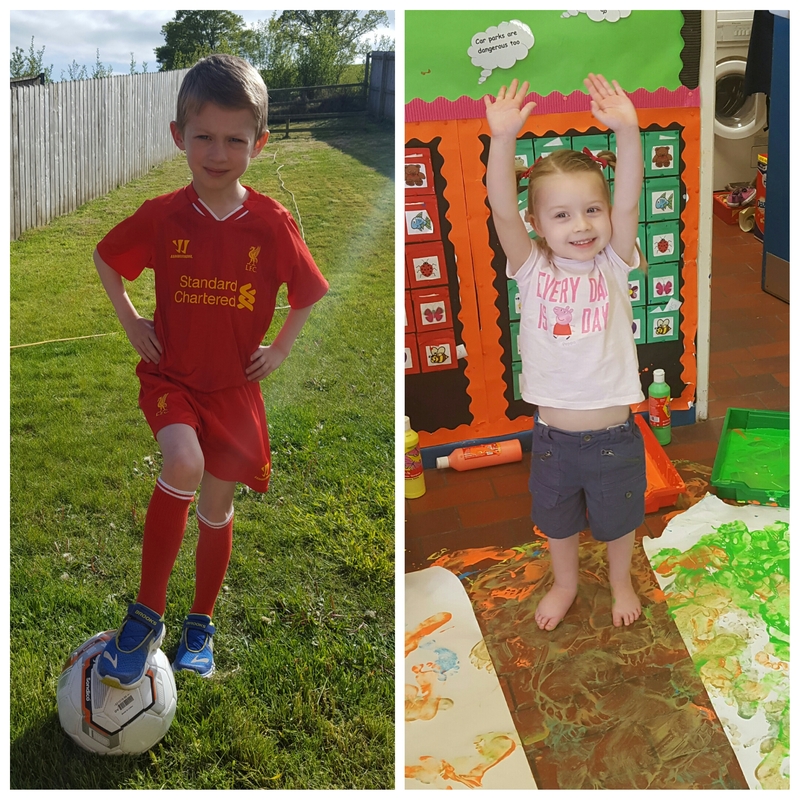 And at one point in the day, as I watched Max and Lucia running around, in and out of the pool and racing up and down the grass I thought how far we have come. Rewind even just a year, and a day like today would have had me on the edge, a ball of anxiety in my belly and feeling completely out of control. But today wasn’t like that. When we got up this morning we decided to get Lucia’s Lymphoedema therapy done as early as possible and get her compression on – that way she would get a few hours of garment wearing in the morning, as we planned to take her compression off for the afternoon and let her be free for a while. But, to allow Lucia to have this freedom and an afternoon of fun we had preparation to do first. The first thing was to check the garden for stones and lift them. Our dog has a love of stones and tends to collect them from the side of the house, leaving them all over the garden. It is a bit of an obsession with her! So Daryn did that and then cut the grass while I pumped up the paddling pool, cleaned it thoroughly (it was filthy after sitting in the shed all year! ), filled it and put the sun tent up. Then I checked the grass again for any stones that may have been missed or embedded in the garden. We also check (believe it or not) for very coarse bits of grass or weeds as these can be very spiky in patches, and got rid of those too. All of this is to minimise the risk of any injury to Lucia’s legs or feet. Our decking also gets a once over for anything that could cause harm, but both children know they aren’t allowed to walk bare foot on the wood in case they get a splinter. So once all of that was done it was bare leg time – though Lucia beat us to it. As soon as the pool was filled she saw Max strip off to his swimming shorts and she wanted to do the same. I found her sitting in the living room trying to haul off her compression and had got stuck half way! So I pulled them off, got her swimming costume on and put on her brand new ‘croc’ styles shoes! 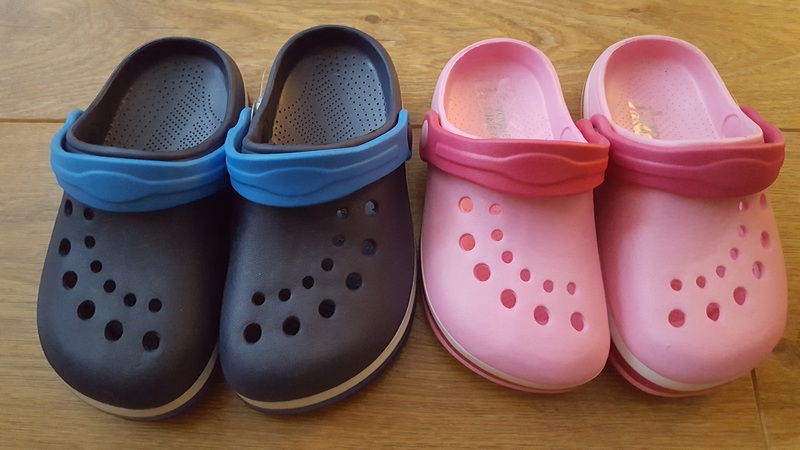 Over the weekend my mum and I went on a trip to Primark and managed to get both Max and Lucia a pair of croc style shoes for holidays and I was over the moon when we got home and found they fitted! So I had extra reassurance that she had a pair of shoes she could manage to put on and take off herself for protection when we were outside today. And we really did have the best day. And I felt like I was relaxed. I couldn’t help but compare today to last year or two years ago. It is amazing how time and experience can make you feel like a different person, can help you to live a little bit more and can minimise some of the fears and stresses. They are still there, but in a more manageable way. The vigilance is obviously still the same, but because we have now done this a few times before it is becoming slightly easier – like second nature I suppose. We checked regularly for any scratches or bites, dried her well after the pool in between her toes, kept her well moisturised and let her run wild to keep the lymph moving! And she was so free. Watching her and Max running around in bare legs and feet together is one of the most beautiful sights in the world. Then, late afternoon, we brought her in and elevated her legs for an hour before dinner to give her a rest. We will be heading off to France pretty soon so this was also great practice for the sunny days we hope we’ll get over there – though it will be very different when we are out of the comfort of our own back garden where we know exactly where the possible dangers lie and how to manage that. But we will do it, we can’t wait to go and we know it’s going to be fab!